A lively debate about the challenges within sheep breeding, some probing questions about the future of disease control in flocks and a celebration of NSA’s activity over a 12-month period all featured in a two-day NSA event, held at the Moredun Research Institute on Wednesday 21st and Thursday 22nd August. The first day saw breed societies affiliated to the NSA gather for the NSA Breed Society Forum, an event held every six months to update breed societies on technical and policy areas and encourage dialogue about different approaches and challenges within pedigree breeding. As well as interesting discussion about the pros and cons of maintaining the genetic diversity seen in the UK – in a ‘Progress versus Preservation debate’ – breed societies were also given the opportunity to discover the latest thinking on the prevention and control of key infectious diseases. Scientists from the Moredun Research Institute presented updates on their research into caseous lymphadenitis (CLA), ovine pulmonary adenocarcinoma (OPA) and the use of new immunogenetics approaches to improve disease control. The second day saw the NSA hold its 120th Annual General Meeting and provide members with an update on the highlights of recent NSA activity, such as driving the discussion on CAP reform and continuing to fight for a common sense approach in the recording of livestock movements. This was followed by an update from Dr Colin McInnes on research priorities at Moredun, before visitors were taken on a tour of the world class facilities at Moredun, both within their laboratories and on the farm. 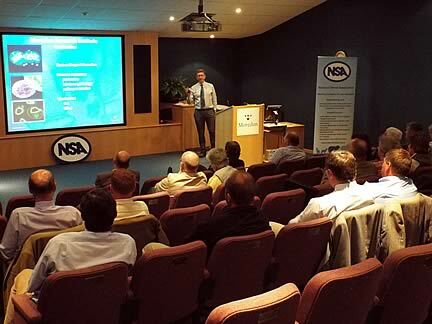 Phil Stocker, NSA Chief Executive, said: “NSA was delighted to hold its Breed Forum and AGM at the Moredun Research Institute. We already enjoy an excellent partnership with Moredun, as all our NSA members benefit from associate membership of Moredun, and spending two days with the scientists and researchers in Edinburgh strengthened this further. Our members highly value the Moredun information that we distribute to them through our communications network, and this was a great opportunity to visit the facility where all that information is generated. The NSA and Moredun have become more closely associated following a membership partnership agreement since 2011. The two organisations are delighted to have increased linkages and collaborative activities to help support the sheep farming industry.